When people talk about madeira, it's usually in one of two ways: either the noble white grape varieties (Malvasia, Bual, Verdelho, and Sercial) or the cheap store brands that are made primarily from the red Tinta Negra grapes. The noble varieties make up a small fraction of what is planted on the island now, since the more robust Tinta Negra took over in response to lower demand and the need to produce wines to a price point. Over the last few decades there has been a slow but steady shift towards producing quality madeiras from the more humble grapes. This particular wine was produced from several different grape varieties, primarily Tinta Negra, which is why it doesn't have a single varietal label. The grapes for this wine were harvested in September 1995, fermented on the skins for two to three days, then arrested with neutral spirit and aged in American and French oak casks. At bottling in 2006 the wine had an ABV of 19% with at total acidity (as tartaric acid) of 7.48 g/l and a total sugar of 120 g/l. Given that Tinta Negra is considered the more mundane grape variety on the island, it's a nice surprise to see how well a madeira can be without being made exclusively from one of the noble varieties. This is as good as any comparably priced Malmsey I've tried (admittedly not many), with fabulous intensity from the aromas. The palate is less complex, but somehow engaging in its relative simplicity. I appreciate that for as much residual sugar as there is in this wine, the total acidity is also rather high, giving it balance through tension. No wonder this bottle was almost entirely consumed at a friend's wine and cheese party, despite the fact that it was the only fortified wine there and almost no one present had tried a madeira before. Hopefully I didn't set the bar too high. Scott's Selection is a now-defunct independent bottler that was owned by the former master distiller for the Speyside Distillery. They have the dubious honor of having bottled quite a number of well-regarded whiskies, but also of being frequently noted as shelf turds during the early-2010s as bottles released in the early-2000s remained firmly on shelves, often at their original prices. This particular whisky was among them, as it was still available at Binny's until a few years ago when the discounts finally became deep enough for some of us to go in on a split. You can find Michael Kravitz's and MAO's reviews from the same bottle. This whisky was distilled in 1988, filled into an unknown cask(s?) (maybe refill sherry and ex-bourbon? ), then bottled in 2004 at 53.8% without coloring or chill filtration. Nose: fairly cask-driven, mild fruity (sherry?) overtones, fresh berries, a solid but not overwhelming layer of American oak, orange and lemon peel, malt and vanilla in the background. After adding a few drops of water the fruit/sherry notes become much stronger, dominating the aromas. Taste: balanced berries/fruit and malt sweetness up front, a bump of American oak with apple and orange overtones in the middle, a slightly hollowness near the back, then more aggressive oak tannins going into the finish. After dilution the berries become stronger up front, with a mild sourness starting in the middle and reduced oak tannins at the back. While this is a little bit raw, it's still pleasantly engaging. I think it was a wise choice to bottle this cask at a relatively young age, because the wood was starting to get the upper hand and it could have gone over the edge after a few more years. Another possibility is that, since this is technically not labeled as a single cask, a more restrained refill ex-sherry cask was combined with a more active first-fill ex-bourbon so that this came out somewhere in the middle. Overall it's a nice but uncomplicated whisky that I wish I had a whole bottle to myself. It drinks easy for something of this strength. Unlike many cognac houses, Maison Ferrand doesn't use the standard VS/VSOP/XO designations for their expressions. Ambre sits around the same price point as most VSOPs from other cognac houses, so that seems like the best way to evaluate it. This cognac is bottled at 40% with coloring (and other 'enhancements') and probably chill filtration. Nose: classic cognac notes of fresh grapes, apples/pears, and raisins, floral overtones, gentle oak in the background, vanilla/caramel, clean laundry, molasses, orange peel. After adding a few drops of water the grape and molasses notes become stronger and more rounded and the orange peel turns into lemon. After quite enjoying their older Réserve, I had fairly high hopes for this cognac. But as a sipping spirit it never really came together for me because the palate never lived up to the aromas. Much like mass market blends, it feels like the spirit has been smothered in an effort to create something with broad appeal. It's a perfectly fine choice for making cocktails, but their 1840 release is going to be an even better choice if you're looking to mix. Still, let's see how it does. The nose is driven by grape notes from the cognac and vermouth, with vanilla from the vermouth and rye, plus herbal notes from the Bénédictine. The sip begins with grape sweetness balanced by oak tannins, runs through creamy vanilla in the middle, and fades out through increasing bitterness at the back. This is easily one of my favorite Manhattan variations because the small tweaks create a much more complex drink. The fairly wet recipe with a touch of liqueur is brought back into balance with an extra doses of bitters. Unless you use a high proof cognac like Louis Royer Force 53, the end result is going to be softer than a traditional Manhattan. Pierre Ferrand Ambre does a respectable job here, which is helped by the fact that the bitters cover up its deficiencies in the finish. Turning once again to the Cocktail Database, I found what looked like an interesting drink, the Sir Knight. Composed entirely of spirits and bitters, I was wary about the preponderance of liqueurs, but hoped that the herbal notes of the Chartreuse and the bitters would keep it in balance. From the first sip it was clear that the drink was simply too sweet, so I added some lemon juice to give it some acidic balance, which finally brought it into line. The combination of its alcoholic punch with the acidic bite of lemon made me think that it deserved the name of the most fraught knight of them all, Sir Lancelot. Combine all ingredients, stir with ice for fifteen seconds, then strain into a chilled cocktail glass and garnish with a strip of lemon peel. The nose is delicately balanced between the cognac, Chartreuse, and orange liqueur, with the herbs keeping the fruitier notes from becoming cloying. The sip begins balanced between sweet grape from the cognac and orange liqueur and the tartness of the lemon, herbal notes and orange dominate the middle, then it becomes more overtly lemon-y and acidic towards the back. The herbal notes return in the finish which lingers with a certain amount of heat. 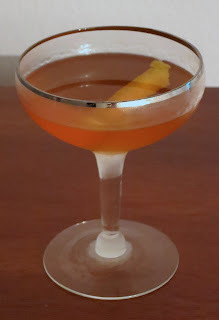 Unlike many cocktails with a more delicate balance, this one contains a rowdy bunch that have fought each other to a standstill. I suspect it could become more mellow as a long drink and might work well built over ice with a healthy dose of soda to lengthen it and give it a bit more snap. 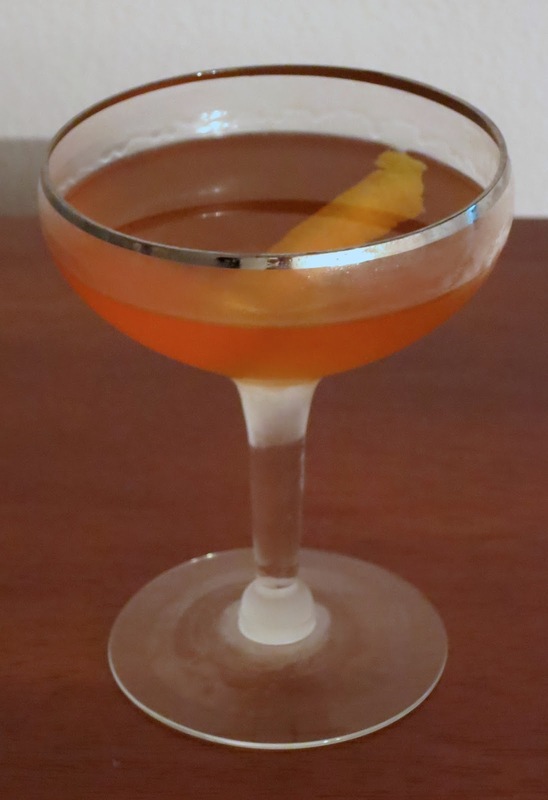 Either way it's worth noting that I made this with Louis Royer Force 53 cognac, so you might need an extra 1/4 oz if you're using the standard 40% ABV kind. 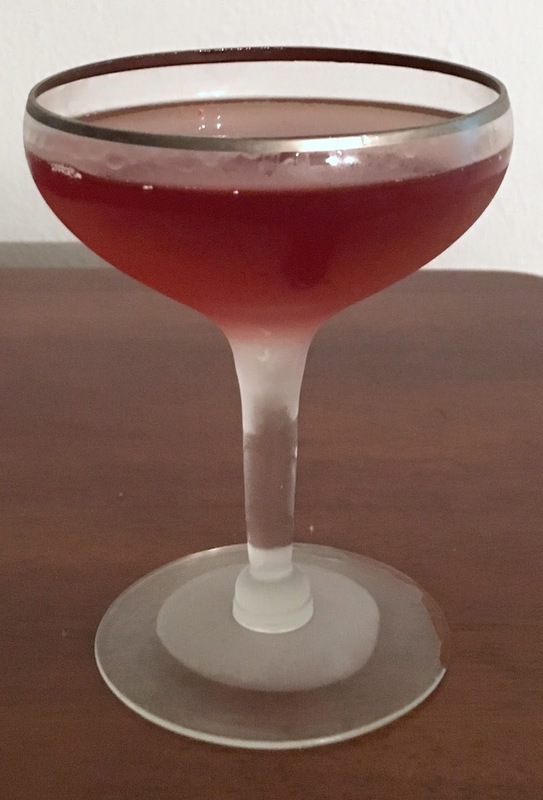 As with many drinks that I have gleaned from the Cocktail Database, it's a little unclear where this comes from since I can't find any other references to it on the internet. From a little more sleuthing it appears to be based on the Sherry Twist from Harry Craddock's Savory Cocktail book. Because the original result wasn't coming together, I added a touch of orgeat to bring things together and a dash of orange bitters to keep it from becoming too sweet. Combine all ingredients, shake with ice, strain into a chilled cocktail glass, then garnish with a sprinkle of cinnamon. The nose balances the cinnamon garnish with the grape notes from the brandy and sherry. The sip begins veers between sweet and sour, rolling through more rounded grape notes from the brandy, then fading out through the dry vermouth with nutty sherry in the background. This drink is a very odd duck. It only barely coheres and could probably use further tweaking to really shine. It should be fairly stiff given that the only non-alcoholic ingredients are a bit of syrup and some citrus juice, but the fact that so much of it is wine based seems to keep it from having too much snap. With all that said, I'm not unhappy with it and could see it becoming a more pleasant drink. 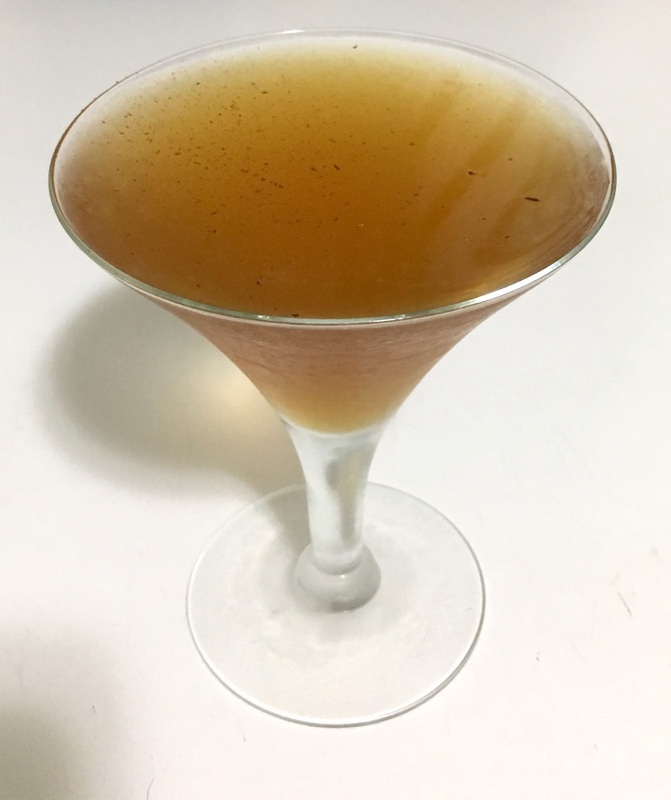 Using a kina wine like Lillet or Cocchi Americano instead of dry vermouth might do the trick, but that could require an extra dose of bitters to keep it from becoming too sweet. Tap Rye is a series of sourced rye whiskies (possible from Alberta Distillers? ), which are 'finished' with the addition of maple syrup or fortified wines, as is allowed by Canadian law. The sherry 'finish' has Amontillado sherry added after the whisky spent at least 8 years in oak casks. This whisky is bottled at 41.5%, probably with chill filtration and possibly with coloring. Nose: solvent, weak grain notes, odd oak, muted rye, raw sherry, raisins. After adding a few drops of water the sherry turns into molasses and it becomes more generically grain-y. Taste: grain, barrel, and a little sherry sweetness up front, oak tannins and rye in the middle with a raw sherry overlay, bittersweet grain going into the finish. After dilution it becomes generically sweet and grainy throughout with sherry in the background. Someone clearly thought this was good enough to put a marketing push behind it, but I just don't see the point. It's unclear whether these were particularly good cask picks to begin with, but the lipstick of sherry hasn't made this pig any prettier. I can imagine that it might be a bit better if this was actually aged in sherry casks to let the components integrate with each other, but the sherry was clearly added rather than coming from a cask so it just feels like an underdone muddle. Can't recommend spending money on this whisky. One of the newer trends in the scotch whisky world is the development of single malts targeted at bourbon drinkers. Often this means malt whisky aged in first-fill ex-bourbon casks to make it sweet and oak-y. Speyburn has joined that crowd with their Arranta Casks expression, which is NAS but boosted to 46% to give it a little more heft than their standard 10 Year. Nose: bourbon cask caramel, orange peel, mild oak, vanilla, milk chocolate, gently herbal malt. After adding a few drops of water there is more vanilla and some berries come out. Taste: big malt and cask sweetness up front, then a slow fade out without much obvious character beyond malt, vanilla, and mild oak. After dilution there is more oak, giving it a bittersweet balance throughout. This is a rather peculiar whisky. I think it largely succeeds at its task of appealing to bourbon drinkers by giving them a relatively simple set of flavors that focus on sweetness and oak. There's nothing offensive, but there also just isn't much going on. At $30-40 it's cheap for a single malt, but relatively expensive compared to a lot of very good bourbons. So while I wouldn't turn down a glass if offered, I can't imagine paying for more with my own money. Time will tell whether it was the right marketing move.